The case against Nicola Sacco and Bartolomeo Vanzetti is among the most widely known and debated criminal trials in United States history. On April 15, 1920, two paymasters from the Slater-Morrill Shoe Company were shot and killed in an armed robbery on the streets of South Braintree, Massachusetts. Though robberies of this kind were by no means exceptional during the post–World War I period, this particular case garnered worldwide attention as an example of egregious injustice. 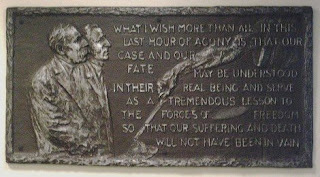 Sacco and Vanzetti, two Italian anarchists, were tried, convicted, and ultimately executed for the crime, despite what many considered to be flimsy evidence against them. The case created an international outcry in the defendants’ behalf and was seen by many as part of a larger movement in this country to crack down on immigrants and radicals during the postwar 1920s. Sacco and Vanzetti’s trial and execution (which took place on August 23, 1927) have inspired a great number of plays, artworks, poems, and books over the years. The Brandeis University Special Collections holds four separate collections on the subject: the Gardner Jackson Collection, the Mrs. Walter Frank Collection, the Tom O’Connor Collection, and the Francis Russell Collection. 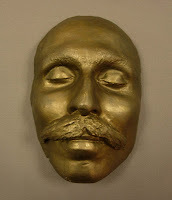 Perhaps among the most interesting objects in these collections are the cast-plaster death masks of Sacco and Vanzetti from the Mrs. Walter Frank Collection. 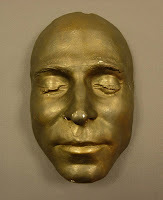 These are the original death masks made following the men’s executions. According to letters between Gardner Jackson, the director of the Sacco-Vanzetti Memorial Committee, and Margaret S. Huntley, a secretary for the New York Sacco-Vanzetti National League, the masks were placed on display at meetings held by activist groups that had fought for the defendants’ release. 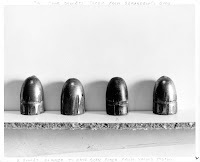 The Sacco and Vanzetti collections at Brandeis University shed light on the case and the public’s strong reactions to it. Though Sacco and Vanzetti were exonerated in 1977 by Governor Michael Dukakis, the subject of their guilt or innocence remains contested to this day.